Nature's Secret: Why Honey Bees Are Better Politicians Than Humans : Krulwich Wonders... Democracy in the human world can be a messy and acrimonious business, but in the bee world, a little waggle dance can help you get all the votes you need. In the spring, bee hives get so rich with honey, so crowded with baby bees, they often burst in two. Some bees stay in the original nest with a new queen, but a second group, led by the old queen, heads off to establish a new home. If there's a cloud of bees hanging by a tree branch in your back yard, that's them — the house hunters. How do they choose a new home? Ah, says Cornell professor Thomas Seeley, this is the beautiful part: The queen doesn't say, "Here's where we're going!" She's not in charge. The decision is made collectively, bottom-up, and it's done by "voting." Ten thousand animals need a place to go. Three hundred of them form a kind of house-hunting "Senate." They're the older, more experienced bees. 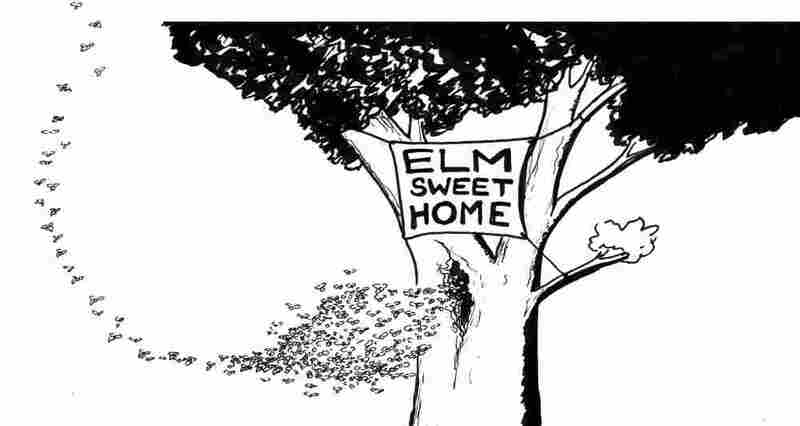 They fly off looking for options: How about that nice hole on the elm tree? Or how about this even nicer hole in the beech tree? 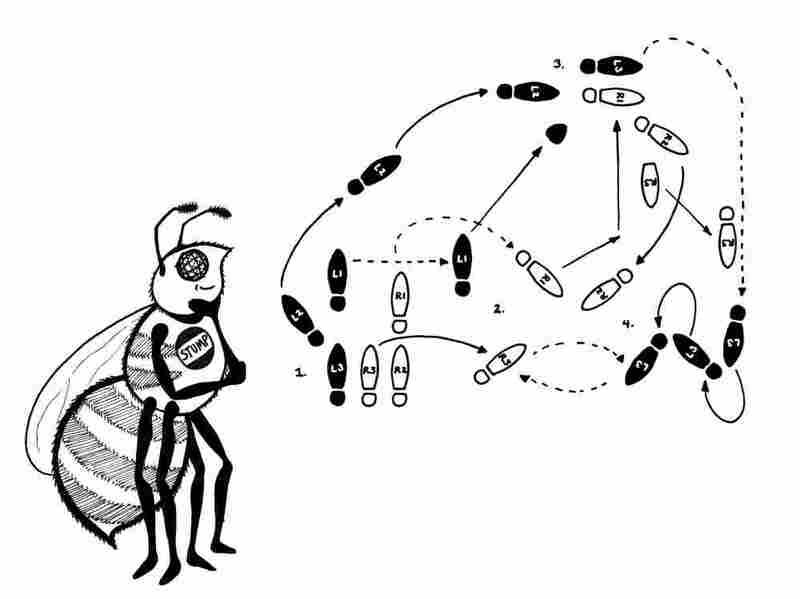 Each scout's dance tells the other bees how to fly to the site — this is done by "waggle dancing," a figure dance that gives bees directions. And if a bee really likes the site, she will dance her directions over and over and over, literally hundreds of times. That way, more and more of her sister scouts see the dance, know where to go, and can fly off and check for themselves. If the site is ho-hum, the second wave of bees will do a ho-hum, say, 10-repetition dance. But if the site is spectacular — high off the ground, narrow opening, facing the right direction, lots of honey storage space inside — then they will give it a spectacular, say, 300-round dance, so more scouts will know where to go. If they like the site, pretty soon everybody is doing the same dance: Let's call it "The Elm Tree" dance. 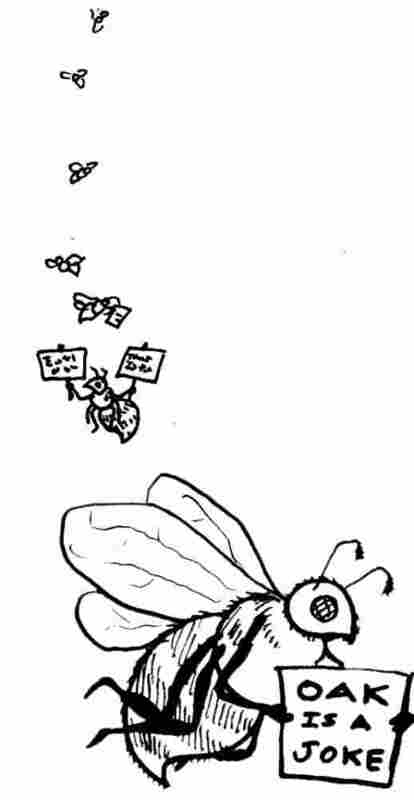 This is how bees "vote;" they dance themselves into a consensus. In my Morning Edition conversation with Professor Seeley, I asked him what happens if one of the bees is just so convinced that her choice is the right one, that she just keeps dancing and dancing, stubbornly advertising the Beech Tree — not the elm tree. How does the hive handle a stubborn bee? Seeley says, "We haven't seen any bees like that." Nope, he says. "In the world of scout bees, you don't have die-hard bees that just dance and dance and dance forever." Seeley thinks he's got an answer, and it's so strange: After careful observation and testing, he believes that once a scout bee has finished her dance — no matter how strongly she feels about her site — she stops caring. He thinks there may be "an internal, neurophysiological process that causes every scout to gradually and automatically lose her motivation to dance for a site, even one that is high in quality." So she's just finished dancing her heart out, telling the hive three times that this beech tree is absolutely, definitely, beyond question the place we need to go, and as soon as she steps back into the crowd, she loses her passion? It just ... dribbles away? And this is genetic? It's built in? "[It's] built in," says Seeley. He calls this his Retire and Rest hypothesis. "And when you think about it," he says, "that works really well." Well, It certainly helps things along if there are no fanatic bees, or insistent bees, or principled bees, gumming up the march to consensus. "Those fanatics," Seeley points out, "they're kind of gumming up the works." True, true. I suppose our House of Representatives would find it a whole lot easier to reach consensus if everybody in the room was automatically drained of passion — and conviction. I'm not sure that's the best way to go about democracy, but it is the bee way. Tom Seeley, in his book Honeybee Democracy, doesn't exactly admire this genetic "forgetting" in bees, but he does mention its obvious advantages. In science, for instance, eminent scientists often cling to bad ideas until they die. One difference between aged scientists and aged [bee] scouts, though, is that the people tend to drop out of the debate reluctantly, sometimes not until death, whereas the bees do so automatically. I cannot help but wonder whether science would progress more rapidly if, in this regard, people behaved a bit more like bees. Maybe "a bit more." But speaking not as a bee, but as me, I'm glad we have our Gandhis, our Lincolns, our Cézannes. 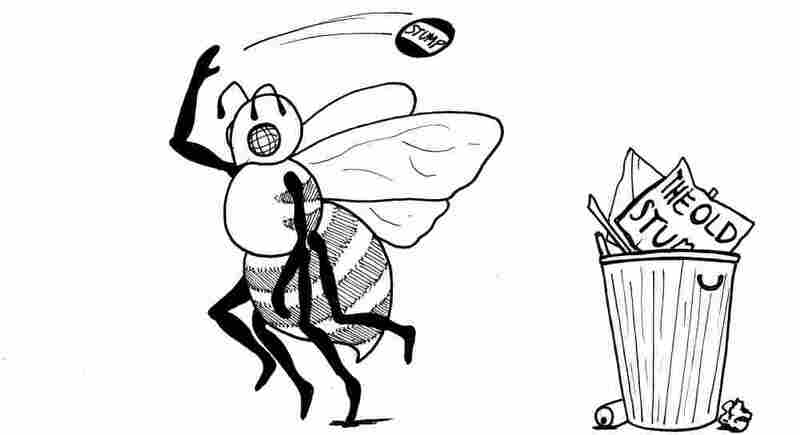 Stubborn people with original ideas are what we've got that the bees don't.